Bihar Intermediate Result 2019: BSEB 12th Result 2019 was declared today at 3:30 PM. 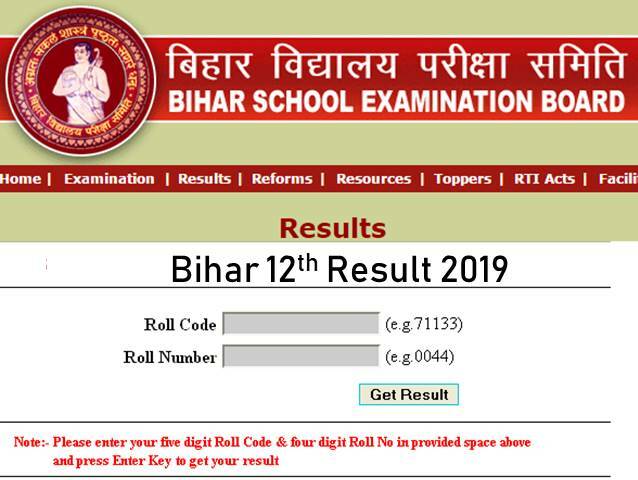 Earlier, the Bihar 12th Result 2019 was to be declared online at 1 PM. However, the result was delayed and was finally released at biharboardonline.bihar.gov.in. Bihar Board 12th Result 2019 is now live on Jagranjosh.com. Students can visit bihar12.jagranjosh.com to check the result. Candidates can visit the official website today to check their Bihar 12th Result 2019. They will need to login with their Roll Code and Roll Number to obtain their BSEB Intermediate Result 2019. The BSEB 12th Result 2019 will carry details such as candidates’ name, roll code, roll number, Subjects and subject-wise marks. Candidates must note the Bihar Intermediate Result 2019 released online today will be provisional. They can collect the original marksheets from their respective schools a few days later. 5:15 PM: Bihar School Examination Board will begin marks scrutiny from 3rd April 2019 to 12th April 2019. 4:45 PM: Bihar Board 12th Result 2019 saw a an improvement of 26.81% pass percentage as compared to last year's 52.95%. The improvement comes two years, when the overall pass percentage fell for two consecutive years. 4:30 PM: Students who are unable to check Bihar Board 12th Result 2019 on official websites can now check the same online on bihar12.jagranjosh.com. 3:10 PM: BSEB Intermediate Result 2019 has been delayed a little further. As of now Board has not announced reason for the delay in making the Bihar 12th Result 2019 available online. The Official website biharboardonline.bihar.gov.in is also currently not functional. Stay tuned for latest news updates. 3:00 PM: Due to huge surge in online traffic, all the official websites have crashed and are inaccessible right now. BSEB is working to fix the website and students are advised to be patient during this time. 2:50 PM: This year BSEB had released the official answer key for objective questions asked in the Bihar Board 12th Exam 2019. This move was intended to bring about transparency in the examination process. Currently, the official website biharboardonline.bihar.gov.in is suffering from technical difficulties. Students are advised to be patient and try revising the page again. 1:50 PM: BSEB Result 2019 is expected to be declared shortly. Currently the official website of Bihar Board is not working. BSEB is working to fix it. Students are advised to exercise patience and keep refreshing the website. Students can stay tuned to this page for latest updates about BSEB Intermediate Result 2019. 1:20 PM: Bihar Board is working on getting the technical aspects in place for the declaration of Bihar 12th Result 2019. BSEB Result 2019 will be declared shortly. 12:50 PM: BSEB has completed the Bihar Board 12th Result 2019 evaluation process early this year, and consequently the result is being announced two months earlier. Last year Bihar 12th Result 2019 was declared in June. 12:40 PM: Bihar Inter Result 2019 will be declared by in an official function attended by Additional Secretary of Education Department Mr R.K Mahajan and BSEB chairman Anand Kishor. 12:00 PM: Bihar Board is expected to declare result today at 1 PM on its official website. Nearly 12 lakh students will receive the outcome of their hard work in the form of Bihar Board Intermediate Result 2019. Stay tuned for live updates about Bihar board 12th result 2019 here.